Do you ever visit someone else’s home or see photos online that leave you wishing that your home was a bit more luxurious? You have added touches here and there to make things more comfortable and more inviting, but your home still lacks the touch of elegance and style that you would prefer to see around you every day. Your master bathroom is always a great place to start with this process of enhancement because it is smaller than a bedroom or kitchen in regards to square footage, but it is still very much a key feature of your home because of all of the time that you spend in there on a daily basis. Do you want to feel like royalty in your own home? Do away with those old fixtures or countertops that were there when you bought the place yet never replaced? 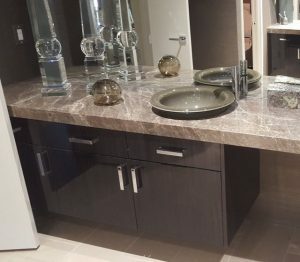 If you’re ready to give your bathroom an overhaul and bring it to the next level, then Moreno Granite and Marble recommends that your countertops and surface materials throughout the bathroom are the best places to start. Going with a natural stone material for your sink, your tub, and your shower will greatly enhance the aesthetics of your room without sacrificing the dependability and functionality of the surfaces. 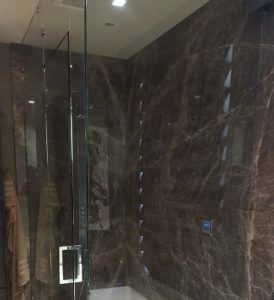 Amber Brown Marble is the perfect choice for your new bathroom remodel or addition because it adds a beautiful touch while also bringing a material that is easy to clean and will stand up to the wear and tear of this high-traffic room. Our project designers and fabrication team bring our best efforts to every client that we work with, and we will make sure that we are creating and delivering a product that exceeds your expectations. 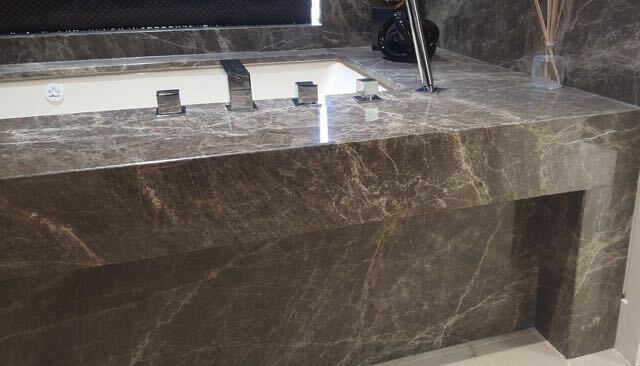 This warm and rich color of marble sets the tone for all different styles and designs and can be used alongside a different texture of natural stone or used as the solitary material for the whole room. Our customers have been very pleased with the appeal that this gorgeous marble brings into their home, and we can’t wait for the opportunity to make you our next satisfied customer. Give us a call today to learn more about how to get your marble project started!